Sadly Avengers: Age of Ultron doesn’t live up to the original film, but for Marvel fans it is a solid effort with some good action sequences. Watching it in Digital HD is a treat and I recommend it for any Avengers fan. While anyone who is a huge fan of the Marvel franchise would want to own Avengers: Age of Ultron, I'm not sure "regular folks" would be as interested. The sequel to the 2012 blockbuster certainly made a great deal of money (just like its predecessor), but lacked the meatier storyline. Coming to Blu-Ray and Digital HD the beginning of this month, Avengers: Age of Ultron is entertaining enough to warrant one watching, at least, though. Once again, all of the Avengers unite to defeat a Tony Stark (Robert Downey Jr.; Ironman)/ Bruce Banner (Mark Ruffalo; Now You See Me) robot named Ultron (James Spader; Boston Legal) that was created to help bring world peace but has grown out of control and now wishes to destroy everything and everyone. He also overtakes Jarvis/Vision (Paul Bettany; The Da Vinci Code) who must eventually fight his way back to aid in destroying Ultron. Avengers: Age of Ultron also brings the addition of new Avengers… Scarlet Witch (Elizabeth Olson; Godzilla) and Quicksilver (Aaron Taylor-Johnson; Godzilla), along with Vision, that ultimately lays the groundwork for cast changes in later editions of the Avengers franchise. These new members bring a welcomed, fresh approach to the team that should help keep the next films in the series ever evolving. Unfortunately, even with great cast and some well-choreographed fight scenes, Avengers: Age of Ultron lacks a solid script to keep the audience interested. The rumor is that the studio didn't give director Joss Whedon (Buffy The Vampire Slayer, Firefly) the freedom to make "his" movie, and the end result suffers because of it. The CGI effects were somewhat cheesy and the action scenes lasted entirely too long. Don't get me wrong, there are always things to like in a movie like this since it is Marvel's Avengers, after all, but it is a bit of a disappointment after the success of the first film. Watching the movie in Digital HD was a pleasurable experience, though. The picture and video quality are superb and every scene is enjoyable from a purely technical standpoint. The extras are what you would expect with this type of film, including a not so funny, three minute gag reel, deleted and extended scenes, a "making of" segment, an overview of the six elements and a look at all of the countries in which the cast and crew filmed. While the features don't add much in the way of new information, they are a little entertaining and mildly interesting. Download Avengers: Age of Ultron from the iTunes Store in Digial HD. 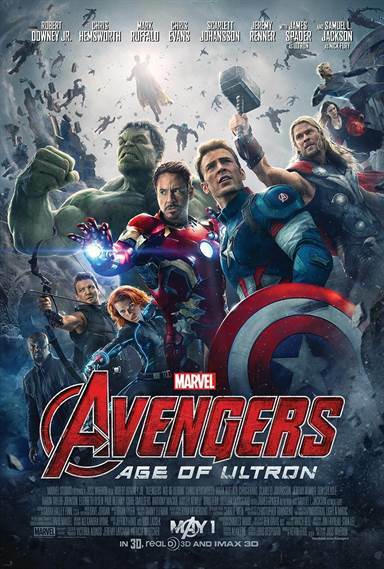 For more information about Avengers: Age of Ultron visit the FlickDirect Movie Database.